We were tired of seeing “what’s my ip?” websites which were slow and messy to use so we launched our own service! All you really need is your IP address, so that’s exactly what we’re going to provide you. Nothing else. The page is just under a kilobyte and will load as fast as it possibly could. 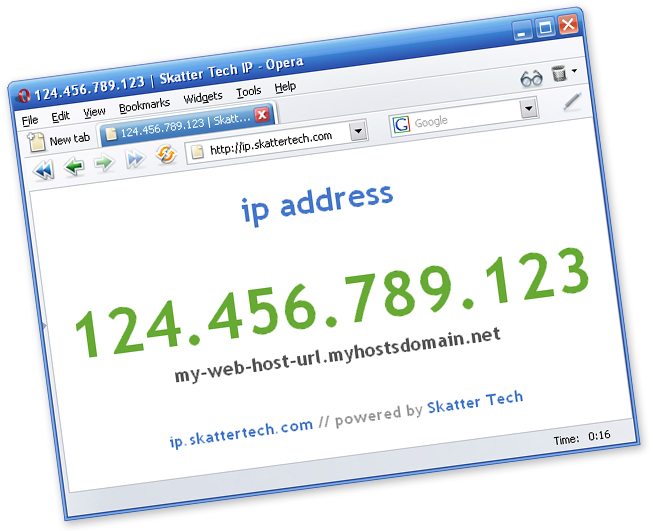 Skatter Tech IP will provide two pieces of data at this time: your ip address and your domain host. At this point this is all we plan to offer, but we plan to expand our tools in the future. And just like the rest of Skatter Tech, any tracked data is completely kept completely private. We will ONLY use it for statistical purposes. Any specific user information will be not be available for ANYONE to view. Anyways, to find out what your IP address is, just visit http://ip.skatter.com. Even hit CTRL+D add it to your bookmarks! If you have any suggestions or ideas to implement into onto this site, just leave us a comment! yup, that works perfectly on DOS-based machines. A lot of people unfortunately do not know about that, therefore this is also a pretty decent alternative which you access from your bookmarks! ipconfig is a useful tool for finding your Local Area Network (LAN) Internet Protocol (IP) address. However, it does not provide information on your WAN address which is what Skatter Tech’s little IP gadget does. is it possible to find others ip address?? How can i get others ip adress without that know that!! how can i find others ip adress? ?